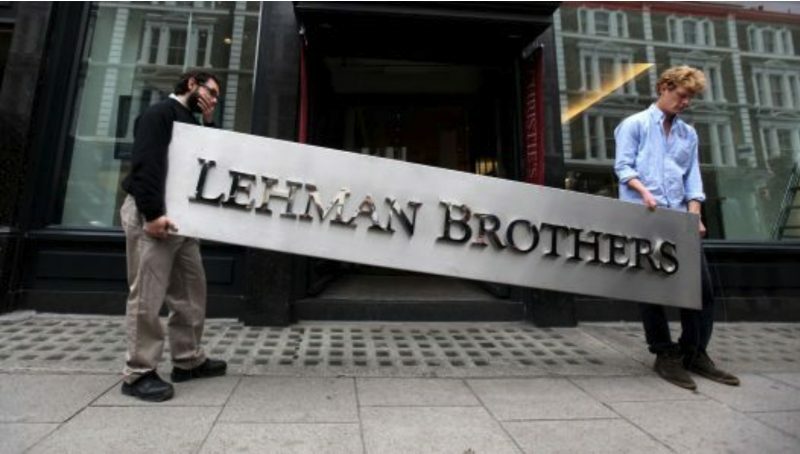 Ten years ago tomorrow, Lehman Brothers filed for Chapter 11, becoming the largest bankruptcy in U.S. history. This came on the heels of the 158-year-old firm failing to find a buyer in the weeks leading up to its demise, and the loss of most of its clients. If there was any question about whether or not we were truly in a financial crisis, the demise of Lehman removed any such doubt. Three weeks later, Congress would vote down the Troubled Asset Relief Program (TARP) sending markets spiraling down even further. Over the ensuing six months, markets would fall another 45% as the crisis went from bad to worse. Looking back, it’s hard to remember just how scary a time that was. Not only were stock markets around the globe plummeting, but there were serious concerns about short-term debt securities and even about the safety of money market funds. Most of my days during that fall and early winter were spent talking clients off the ledge and trying to provide some longer-term perspective. Although the Great Depression was, in hindsight, much worse than the Great Financial Crisis of 2008-9, it wasn’t clear at the time that what we were living through wouldn’t be as bad, and so the Depression was the comparison point I often used for talking about what markets could do and how they might eventually recover. I know there has already been an endless amount of ink spilled this week on retrospective and lessons learned from the Great Financial Crisis of 2007 to 2009, but I’ll add eight thoughts to the list. 1. Despite stocks having fallen more than 45% in the aftermath of Lehman before finally bottoming out in March of 2009, an investor who owned a well-diversified globally allocated equity portfolio on the day Lehman went bust and who stayed invested since has since seen an annualized return of more than 9% per year. That 9% per year return was not terribly far off from what equities have historically provided to investors, but the intervening volatility was quite painful, to say the least. Unfortunately, there is no way to separate the volatility of stocks from their historically superior long-term returns. 2. On the topic of volatility, it’s also worth pointing out that while diversification usually helps reduce pain, when the world appears to be ending, as it looked to be in the Fall of 2008, the correlation of all assets goes to 1. Said another way, even well-diversified portfolios can temporarily fall 40% to 50% as happened in 2008-9, diversification be damned. 3. At the same time, however, the crisis keenly illustrates the value of diversification across securities. 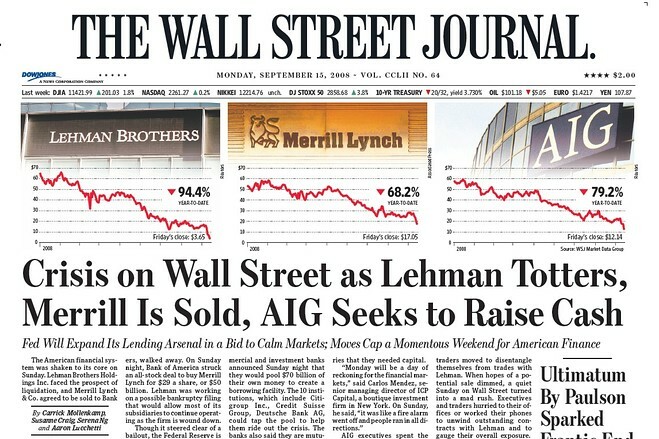 To wit, people who had too large a share of their net worth in AIG, Citibank, Bear Stearns, or Lehman were wiped out. While owning a single stock—or even a small handful of stocks—can occasionally make you rich, it can also make your very poor, very fast. 4. Despite the depth and severity of the crisis, time has historically healed all wounds for diversified investors, and this turned out to to be the case following the 2008-9 debacle. During both the Great Depression and following the Great Financial Crisis, stocks recovered within about four years of bottoming on an inflation-adjusted, dividend-included basis. This speaks to the self-correcting nature of markets and economies. 5. While owning equities can be scary at times, sadly, many millennials learned the wrong lessons from the crisis. I have seen several situations (and read of many more) where a 55 to 70-year-old client will have substantially higher stock exposure than their twenty-something children, some of whom are 100% in cash and think that stocks are too volatile, despite their having returned more than 9% per year since late 2008. 6. While most people with capital and/or strong career prospects have recovered from the crisis, many of those without one or both have seen their economic outlook dim considerably over the past decade. This has contributed to the opioid epidemic, the current political environment, and the trend towards increased nationalism and greater protectionist trade policies here in the U.S. and across Europe. It’s been said that the deepest crises always lead to populism. The Great Financial Crisis and its aftermath would be a case-in-point. 7. While it’s easy in hindsight to see how all the pieces fit together and how the financial crisis was inevitable, in reality, very few people made much money predicting the crisis, although a few of those who did made spectacular sums of money. However, proving that past is not prologue, some of those very same investors (to wit, John Paulson) have since made spectacularly bad bets and given back the lion’s share of what they garnered during the crisis. 8. Finally, ten years ago in the depths of our collective despair and on the eve of Lehman’s demise, it would have been nearly impossible to imagine that, ten years later, we would be in the midst of a nine-year, record-breaking bull market, with corporate profits at all-time highs, household net worth at $100 trillion—twice what it was pre-crisis, and unemployment at 3.9%—even lower than it was before the crisis. This remarkable turn-around, and the self-healing power of markets—both of which are more the norm than than the exception—will be worth remembering whenever it is that we next see the economic storm clouds that appear above our heads every now and then. Hopefully, we won’t see the likes of anything like the 2008-2009 financial crisis for a long time to come. It was an unnerving time for anyone who lived through it and I, for one, am very glad to be looking back with that whole episode ten years in the rearview mirror. I’m sure you are too. As always, please let me know if there is anything we can do for you.